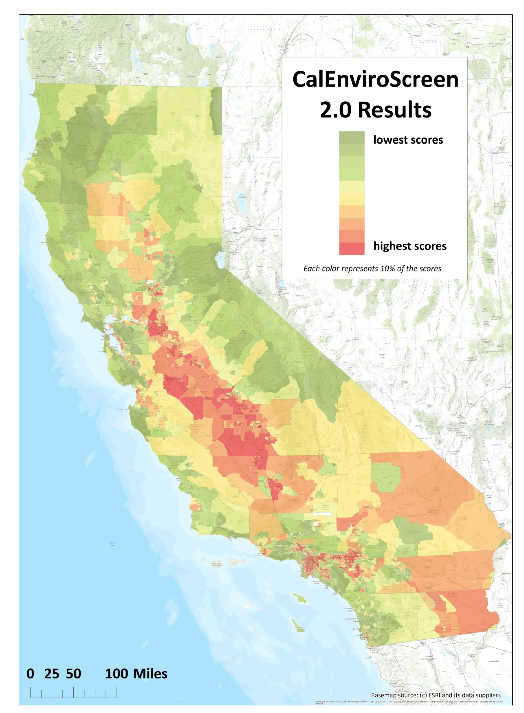 Disadvantaged Communities in California, as measured by CalEnviroScreen. For detailed maps by census tract, go to this website. Image: CalEPA. The end of summer has become Public Workshop Season in California. With new funding coming from the state’s cap-and-trade system in several categories, state agencies are figuring out how to best spend that money, and the first step is asking for help in creating guidelines for eligible projects. Last week the Strategic Growth Council held workshops on guidelines for the Affordable Housing and Sustainable Communities program. This week and next the California Environmental Protection Agency (CalEPA) will ask for help figuring out how to define “disadvantaged communities,” which by law must benefit from a proportion of projects funded by cap-and-trade money (more about this below). Last week and this week, the California State Transportation Agency is hosting input sessions for the Transit and Intercity Rail Capital Program ($25 million, and 10 percent of future cap-and-trade proceeds) and the Low-Carbon Transit Operations Program ($25 million and 5 percent of future proceeds). These somewhat overlapping efforts are all supposed to demonstrate reductions in greenhouse gas emissions (GHGs) to move California towards the climate change goals of SB 32, which requires a reduction in GHGs to 1990 levels by 2020. It’s all new: the funding source, the program intentions, the attempts to measure GHG reductions, and the collaborations required between agencies, operators, and government sectors. The low turnout at Friday’s workshop on transit funds—the first of three—may have been due to lack of publicity or maybe the amount of money available ($50 million total for all of CA) does not add up to much for individual agencies. There are more than a hundred transit agencies, large and small, throughout the state. While the Intercity Rail portion will be allocated to particular projects, the Low-Carbon Transportation Fund will be divided up according to existing state funding formulas. Only $25 million spread statewide for operations funding means that small agencies in areas with low populations and low farebox revenues are likely to see only very small amounts of money. For some, this will be less than $100—at least in this first year. That’s hardly enough to enhance or expand services to increase mode share, as required by the allocation. And it may not be worth the effort at all, if reporting requirements are anything more than a simple check-box. A number of those attending the workshop requested that administrators keep the process as simple as possible so as not to cause more work for small and understaffed agencies. What Qualifies as a “Disadvantaged Community”? 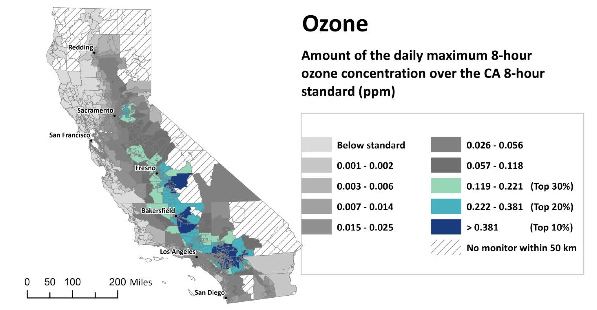 CalEPA workshops this week and next on defining “disadvantaged communities” will play a crucial role in deciding how to allocate cap-and-trade funds. Overall, at least 25 percent of all cap-and-trade funds must be spent in, or somehow benefit, a disadvantaged community. In the case of the Affordable Housing/Sustainable Communities category, half of funds must benefit these communities. So the definition of “disadvantaged community” is pretty important. CalEPA has developed a mapping tool called CalEnviroScreen for the purpose of identifying these communities. It combines two definitions of “disadvantaged”: areas that are affected by pollution and areas where residents are most vulnerable to pollution. The tool itself has already gone through a workshop process, and public input was incorporated into the newly released version. For example, the new version uses population statistics at the census tract level, a smaller and therefore more finely grained scale than the zip codes of the earlier version. Nineteen factors are measured for every census tract in the state; twelve address the pollution burden (air quality, groundwater threats, toxic releases), and the other seven are indicators of vulnerability to that pollution (poverty, unemployment, number of asthma emergency visits). Each of these factors are rated relative to the rest of the state, giving an overall score for every census tract. “The tool just gives you a spectrum of results,” said to Arsenio Mataka, one of the designers of EnviroScreen. “It doesn’t tell you how to apply it, or that we should only be looking at the top X percent of any particular indicator,” he said. The public workshops are a chance to help the agencies figure out how best to apply the tool for the purposes of allocating cap-and-trade funding. An accompanying report describes in detail each factor rated and why it was chosen [PDF]. Not every ranked factor relates to greenhouse gas emissions, and others are used as proxy measurements. For example, pesticide use is one of the environmental factors in the tool, and although it affects health, it doesn’t directly affect GHGs. Also, the tool uses traffic density–usually more of a problem of convenience–to show local exposure to vehicle pollution. Some expressed concern that applying the tool without due care may not give credit where it is due. Joanne Parker of Sonoma-Marin Area Rail Transit pointed to a recent HUD-funded study for the Metropolitan Transportation Commission that found that more than half of low-income people in the Bay Area do not live concentrated together. That means these populations may not show up as “disadvantaged” in the CalEnviroScreen tool, because their income is averaged in with other nearby residents. Tonight, Tuesday August 26, in L.A., from 6 p.m. to 8 p.m. in the Junipero Serra Building, Carmel Room, 320 West Fourth Street in downtown L.A.
Wednesday, September 3 in Oakland , from 6 p.m. to 8 p.m. at 1515 Clay Street. Written comments can be submitted until September 9 here. GMO corn fuel ethanol affect the beef or water? BP-DuPont butanol affect the water? Meeting in DTLA Thursday. State law requires a portion of California's cap-and-trade money go to disadvantaged communities. Public workshops this week and next will explore how the state should define "disadvantaged communities" as well as how to assess benefits to those communities. CA Tackles the Question: What Is a “Disadvantaged Community”? While there is a push to make quick decisions and get projects on the ground fast, there is also counter pressure to take enough time to get these decisions right. There won't be another opportunity to raise money for transportation any time soon.